The Spanish built Talgo train demonstrated in San Diego service for a two week period running daily during that time except on Fridays. I rode it on round trips every day it was in San Diegan service. 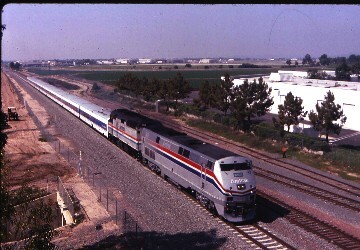 I will use my trip home from San Diego on Tuesday March 18th, 1996 as an example of a trip on board the Talgo train. The Talgo is a Spanish built train that uses peculiar train technology. The train uses gravity to tilt through curves while maintaining its speed while regular trains must slow for the same curves. This Talgo set was twelve cars with a power car, a sleeping car, one first class car, a dinner/lounge, the Bistro car, six coaches and a baggage car. The Talgo is a self contained train and can be pulled by any type of motive power. The first class car has two/one seating for 36 passengers while the regular coaches have two/two seating the total carrying capacity of the train is 244 passengers. The cars have panoramic windows, reclining seats, seat back tray tables, AC outlets at your seat and 17 inch television monitors below the ceiling. The train is really comfortable and a real joy to have a chance to ride. We left San Diego on time with Larry Wheeler as our conductor on this leg of my round trip home. The Talgo rides really smooth as there are no seats over the wheel sets. The ride is quiet as there are doors at both ends of the cars. Each car seats 26 people and are much smaller than regular passenger cars. I sat back and waited for the first curve which I did not even notice. The Talgo rolled northbound passing through Elivara before taking the east track up Rose Canyon. I was really looking forward to the train's descent down Miramar Hill's steep and curving northern grade. The truth was as we went down the grade, I did not even feel any of the curves. It is an amazing train the way it handles curves. We reached Sorrento where our engineer opened up the speed to 90 MPH and the Talgo followed gliding along at that speed. We slowed for the run along the bluffs along the beach and once again I did not notice the curve. We went through Del Mar and passed the darkened Del Mar Race Track before reaching Solana Beach. After picking up a few passengers the Talgo was back up to speed. The Talgo raced through Cardiff, Encinitas and Carlsbad before sprinting into Oceanside where the train was met by the US Border Patrol looking for illegal aliens. We boarded just a few passengers as six people were removed by the border patrol. We headed north speeding through the night across Camp Pendleton before passing the brightly lit San Onofre Nuclear Power Plant. We made our way along the empty beaches of San Clemente where not a single bonfire was lit on this night. We passed the well lit San Clemente Pier before getting back up to speed at North Beach. I was waiting for the curve off of the beach and as we neared I closed my eyes to try to feel the curve. Once again the Talgo prevented me from doing so. We arrived at San Juan Capistrano early and after dropping off our passengers, we headed north climbing the El Toro Hill. The Talgo glided up the grade and a few minutes later we had arrived at Irvine. From there it was a quick and smooth 9.8 miles home to Santa Ana where I detrained after another interesting and exciting ride on the train from Spain, the Talgo.